You are here: Home / Eat Right / Probably the best darn soup I’ve ever had! Probably the best darn soup I’ve ever had! Soak your lentils overnight in water. The next day, roast butternut squash with a little olive oil and salt and pepper in the oven, probably at about 375F until done. Meanwhile, chop up onions, carrots, celery, garlic, the bottom white part of the leek and sauté in a soup pot in grapeseed oil (my preference as it’s high in antioxidants and has a high smoking point) until soft. Toss in the lentils, and sauté more. While you’re doing this (and the butternut squash is still cooking), toss the rest of the vegetable parts into a separate pot with a little vegetable bouillon cube to make a vegetable stock. Once everything is cooked, remove the peel from the butternut squash and toss in the blender (or a food processor). Toss in the lentil mixture and blend. Then drain the vegetables from the vegetable stock and mix some of the stock into the blender to make the mixture liquidy (thick but soup-like). Add a little butter and a little heavy cream (I’ll probably skip this part as my son can’t eat dairy). Add salt and pepper to taste. Serve with a little bread and a salad and voila! you’ve got the perfect light meal! If you try it (or your own version of it) and let me know how it goes! 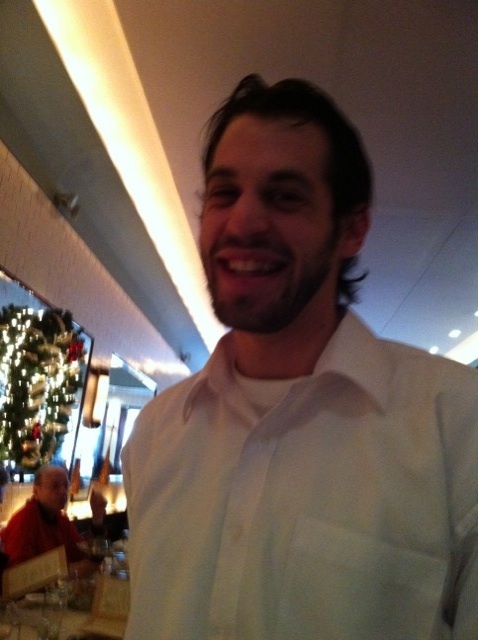 By the way, this is Daniel, below,..the helpful, amazing waiter. Written by: Valerie Latona on December 14, 2010.